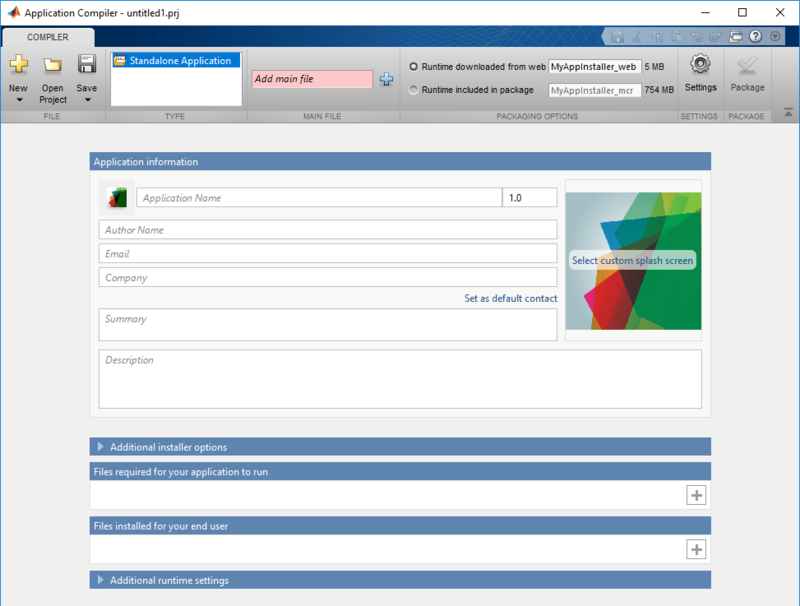 The Application Compiler app packages MATLAB® programs into applications that can run outside of MATLAB. MATLAB command prompt: Enter applicationCompiler. Name of the function to package as a character vector. The selected function is the entry point for the packaged application. You can decide whether to include the MATLAB Runtime fallback for MATLAB Runtime installer in the generated application by selecting one of the two options in the Packaging Options section. Including the MATLAB Runtime installer in the package significantly increases the size of the package. Files that must be included with application as a list of files. Optional files installed with application as a list of files. Check the appropriate boxes if you don't want a command window to show up during execution or if you want a log file to be created. Flags controlling the behavior of the compiler as a character vector. Folder where files for testing are stored as a character vector. Folder where files for building a custom installer are stored as a character vector. Folder where generated installers are stored as a character vector. Name of the installed application as a character vector. For example, if the name is foo, the installed executable would be foo.exe, the start menu entry would be foo. The folder created for the application would be InstallRoot/foo. Version of the generated application as a character vector. Image displayed on installer as an image. Name of the application author as a character vector. Email address used to contact application support as a character vector. Brief description of application as a character vector. Detailed description of application as a character vector. Folder where the application is installed as a character vector. Notes about additional requirements for using application as a character vector.